Mantova - or Mantua in Emilian dialect - in Lombardy is famous for its artistic and cultural heritage and, under the rule of the Gonzaga family, had one of the most important courts of the Renaissance. In 2008 the city of Mantova became a UNESCO World Heritage Site. In 2005 the Italian environmental organisation Legambiente named it Italy's most liveable city for quality of life. Surrounded by three artificial lakes created in the twelfth century, Mantova is a city still full of Renaissance splendour where visitors can also enjoy the tranquility of the lakes or a walk or cycle ride along the banks of the River Mincio. Here is our list of things to do in Mantova, beginning with a current exhibition. 1. If you are going to be in or near Mantua [Lombardy] between now and 27th June you will have the chance to see an unusual exhibition of tapestries which belonged to the Gonzaga family. Gli arazzi dei Gonzaga nel Rinascimento [The Gonzaga Renaissance Tapestries] is at three locations: the Palazzo Te, the Museo Diocesano Francesco Gonzaga and the Museo di Palazzo Ducale and brings together 34 tapestries collected by the three sons of Francesco 11 Gonzaga [1466-1519] and Isabella D’Este [1474-1539]. During the time of Federico II Gonzaga, the first Duke, his brothers Ercole, a cardinal and Ferrante, an army commander and later Governor of Milan, the ownership of tapestries was becoming a symbol of wealth and power. The brothers collected hundreds of tapestries from Flanders or that were worked by Flemish weavers in Italy. Often the tapestries were copied from paintings of the time. After the brothers’ deaths many of the tapestries were destroyed, dispersed or acquired by other noble Italian families and only 52 have come down to us today. Art historian Guy Demarcel has studied all these works and is the curator of the Mantua exhibition. 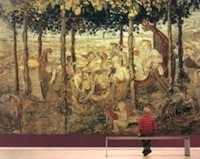 Some of the tapestries are on loan from other European museums. 18 of the tapestries are on permanent exhibition at the Palazzo Te. Exhibition tickets, costing 8 – 10 euros, are valid for all three locations as well as for the Museo della Città di Palazzo San Sebastiano. Pre-booking is advised here. 2. While you’re at the exhibition, take a look at the Palazzo Te itself. It was built for Federico II Gonzaga by Giulio Romano between 1525 – 1535 and was the Duke’s summer residence. 3. Visit the Cathedral, most of which was built between 1395 -1401 but the Baroque façade dates from the eighteenth century. Admire the Piazza Sordello while you’re there. 4. Visit the Rotonda di San Lorenzo, the city’s oldest church, built in the late eleventh century. 5. After all that culture, you’ll some sustenance, so why not head for one of the cafés in the Piazza delle Erbe and order luccio in salsa [pike in green sauce] or tortellini with zucca [pumpkin]? 6. If it happens to be a Thursday, there is a market in Piazza Erbe. 7. On the third Sunday of the month there is an antiques fair between Piazza Erbe and Piazza Castello. 8. Want to do something different? On request you can visit the 1769 Teatro Bibiena. 9. Want to get away from it all? Take a boat tour on the Lago di Mezzo or the Lago Inferiore. In this photo: view of Mantova from the Lago di Mezzo - by Pietro Liberati. Buon divertimento a Mantova – Enjoy Mantua!